We know how much of a hassle having a real grass lawn can be. Whether you have grass for your residential or commercial property, the constant maintenance of reseeding, mowing, watering and dealing with brown spots is a huge inconvenience. For some, no amount of fertilization and care can provide the results desired. It is for all these reasons that MAE Landscaping, Inc. has come up with the perfect solution to fixing your sad-looking sod. Artificial grass and synthetic turf provide our customers with the perfectly green lawn of their dreams. 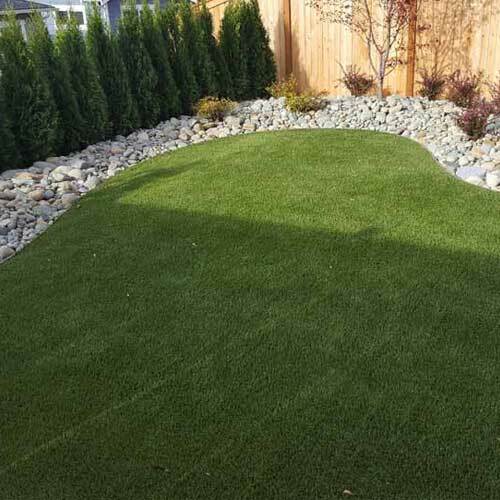 Unlike other artificial turf companies in Snohomish County and Northern King County, our state-of-the-art installation process ensures a natural-looking lawn for both small and large areas. In fact, we can even install our high-quality synthetic grass indoors! How much would you enjoy having extra time to spend your weekends playing with the kids, taking a day trip or even sleeping in for a little longer instead of mowing the lawn for hours? Because our fake grass is so easy to maintain, you will spend less time worrying about keeping your lawn looking presentable, and more time enjoying everything you love. MAE Landscaping, Inc. is dedicated to saving you valuable money and time. Artificial Turf for Dogs: Artificial turf is a great option for all pet lovers who are tired of seeing the brown spots associated with pet waste. Sometimes, even after repeated reseeding, real grass just will not grow back. Synthetic grass for dogs gives Fido the chance to run around and play without giving you a headache about how the grass will look tomorrow. Fake Grass for Commercial Properties: Make a lasting impression on your employees and customers with a sprawling landscape of synthetic turf that stays green all year long! Our synthetic grass gives you an authentic grass look and feel without all of the water and labor costs to maintain a real lawn in a commercial setting. Putting Greens: Want to work on your golf game right from the comfort of your home? Our professional team can come up with a spectacular design for both indoor and outdoor putting greens. Practice without the distractions of others any time of the day or night! Residential Synthetic Lawns: MAE Landscaping, Inc. provides synthetic lawn installation for residential areas as well. Create a beautiful and eco-friendly lawn space that does not require much maintenance and never requires wasteful watering! We can even help you design a stunning and functional yard for your home. Find out more about your landscaping services here. You can rest assured that our affordable prices will allow you to have that picturesque green lawn you’ve always dreamed about. Contact us to learn more about our synthetic turfs and how we can provide you with an artificial lawn solution today! MAE Landscaping is the only company you need to contact when considering a landscaping contractor in Snohomish County and Northern King County. Our company specializes in a diverse range of services and products to fit your every need.